Earlier today, Apple aired a new commercial for the iPad Pro, with a focus on the Retina display, iOS 9 Split View multitasking, and drawing with Apple Pencil on the new device. There's a great big universe in the new iPad Pro. It's the largest iPad ever and takes your creativity and productivity to an epic scale. In the ad, featuring Alabama Shakes' Sound & Color as the background song, Apple starts by showcasing the space-themed imagery that's been on marketing materials for the iPad Pro since its introduction in September. 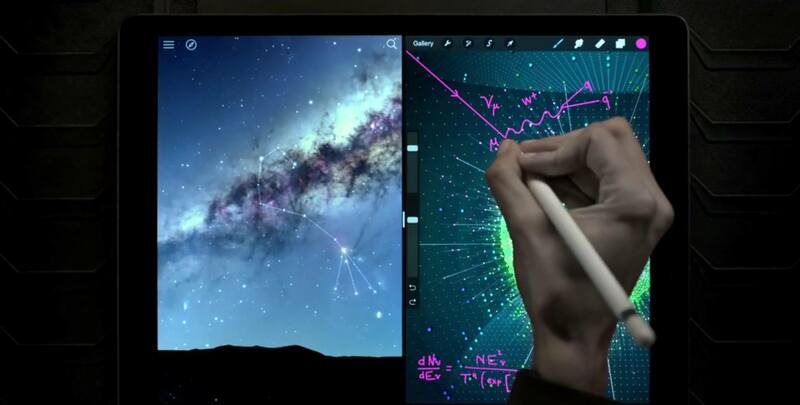 Then, the video zooms out to reveal Sky Guide and Procreate, working simultaneously in multitasking on the iPad Pro. Apple Pencil, the iPad Pro's stylus accessory to draw and annotate, is also showcased in the commercial with annotations in Procreate – one of the apps that has been updated with early iPad Pro support. Today, Apple confirmed that the iPad Pro is launching this Wednesday, November 11, for online orders, with retail availability to follow later in the week. You can watch the ad below.